When a leading English daily approached Mulayam Singh Yadav to pen his musings, the Samajwadi Party (SP) founder, who knows little outside of politics, confided to an associate that all he’s seen in his autumn years were family feuds and estrangement and it wasn’t worth recording his experiences. The associate suggested that the 79-year-old patriarch could reflect on his life and times “philosophically”, to which Yadav’s answer was philosophy was beyond his ken. Yadav is contesting again from his fief but retaining Mainpuri does not weigh him down as much as resolving an acute political dilemma in Firozabad. His predicament arises from the fact that two close family members meet head-on in the town, 45 km from Agra. They are Yadav’s younger brother, Shivpal Singh Yadav, and Akshay Yadav, the son of his cousin and Rajya Sabha MP, Ramgopal Yadav. Yadav senior always had a soft spot for Shivpal, the youngest in the family, who he brought up after their parents passed away. Ramgopal--a nephew of Yadav senior’s first wife, Malti Devi, and, therefore, not Shivpal’s blood relative-- is said to have conceived and executed the game plan for Akhilesh Yadav’s annexation of the SP. The coup de grace—that left Yadav senior out in the cold—so outraged Shivpal that he parted ways with Akhilesh and formed his party, the Pragatisheel Samajwadi Party (Lohia). The SP splinter is contesting 52 seats of which Kannauj, Azamgarh and of course Mainpuri were strategically excluded not to hurt Yadav senior. Kannauj is the constituency of Dimple, Akhilesh’s wife while Akhilesh is in the fray from Azamgarh. The question asked in Firozabad was, who has “Netaji” (Mulayam Singh)’s “blessings”. Ramgopal’s camp followers hoped that Yadav senior will put in an appearance at a rally in Firozabad on April 20 that will be addressed by Akhilesh and his allies, Mayawati of the Bahujan Samaj Party (BSP) and Ajit Singh of the Rashtriya Lok Dal (RLD). “The frame will be incomplete without ‘Netaji’,” an SP source remarked. However, a source close to Ramgopal maintained that Yadav senior’s “indifferent” health altogether kept him away from campaigning. “It’s a fight to keep Ramgopal’s prestige and his son’s,” said Devinder Singh Tomar, a local Rajput leader working hard to regroup his community’s votes around the SP. The Bharatiya Janata Party (BJP) has put up a Rajput, Chandrasen Jadon, a former legislator, who was dismissed by both sides as a “non-entity”. That meant the upper caste votes, including those of the Rajputs, were in limbo, although the Rajputs are organically linked with the BJP because Yogi Adityanath, the chief minister is a clansperson. Apart from the threat of Shivpal slicing away the 4.5 lakh Yadav votes in the nearly 18 lakh strong constituency that votes on April 23, Ramgopal’s hold over Firozabad was weakened in the 2017 assembly polls, despite Akshay winning it in 2009 and remarkably in 2014 after bucking the “Narendra Modi wave”. The BJP wrested four of the five assembly segments while the SP kept one, Sirsaganj. Hari Om Yadav, the SP’s lone MLA, went over to Shivpal as did Azim Bhai, an influential Muslim leader of the Pathans. In 2017, Akhilesh threw Azim Bhai out of the SP for supporting a candidate of the Majlis-e-Ittehadul Muslimeen in the Firozabad mayor’s election. Wajid Naseer, the SP’s Agra region president, contended that if the Pathans went away with Azim Bhai, Akshay was backed by the “equally powerful” Siddiqui sect whose votes were divided between the SP and the BSP in the past. The SP-BSP tie-up took care of this problem. More significantly, in this apparently close contest, the SP has the advantage of securing the 2.5 lakh Dalit-Jatav votes, wrapped around Mayawati’s finger. In a reversal of roles, Ramgopal was his son’s generalissimo, micro-and-macro managing everything on the field and at the SP’s headquarter. Akshay kept a low profile. Shivpal was in charge of the backend operations, while his 30-year-old son, Aditya Yadav, led the battle from the front. “My campaign is focussed entirely on Akshay. He’s been an MP for 10 years but hardly speaks in Parliament. Firozabad has huge problems like lack of drinking water and a financial crunch in the glass industry. The city needs someone like Shivpalji to flag these issues in the public domain,” said Aditya. 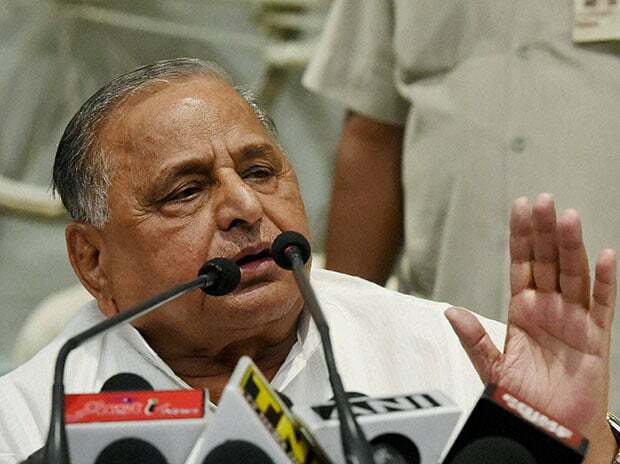 The acrimony has left Mulayam Singh Yadav, the paterfamilias embittered in his twilight years, after fostering Shivpal and Ramgopal without discriminating.